"Just wanted to say thanks again. I now drive easily between 260 and 270 yards on a drive. I have hit 300 yards three times this summer each one straight. My last nine hole round (yesterday) I shot a 40 on a par-35 9-hole course. My best over a month ago was 7 over par on an 18-hole par-61 course." "Last Monday (yesterday - Labor Day) I smoothed out the drive swing a little, practice some drives, and then played eighteen holes. I hit two drives for 320 yards and one for 300 yards! I almost could not believe it. The ground was soft and fairly level, and the grass was a little high; so my drive may have gone farther if the grass had been cut. My golf partner was so shocked he started asking my advice on his drives. What a day! Just had to let you know." "I've increase my swing speed by 12-15 mph to about 120 mph...I feel stronger and less vulnerable to injury and sore back since doing the training." "After 7 days of training...I can already feel the power." 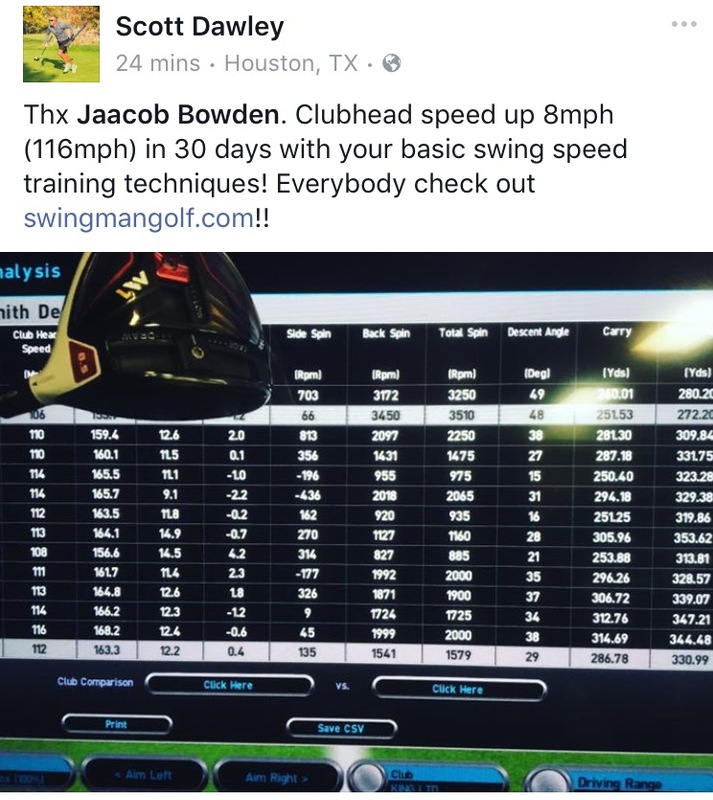 "I am about 2.5 weeks into my training and my average speed is up from 94 to 103 mph on 30 driver swings." "I'm up to 125 mph in swing speed now from 107, aiming for 130 this summer, thanks to your site"
"I've used your basic swing speed training routine...which I worked diligently for 30 days. My overall distance has increased up to 30 yards." "Jaacob, enjoying the program. started at 96 now up to 117." "Jaacob, this is some very valuable information. I am starting to see the light again thanks to you." "I know I've said it before, but it seems every time I need some assistance, you and your staff are always there with not only a reply but, the answer. I have mentioned to others about what a great investment a membership in your Swing Man Golf is! I review it most every day during the golf season. Thanks again!" My swing speed was 100 on average. My average today was 109 with a high of 112. 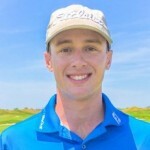 “Many people are aware of Jaacob Bowden’s phenomenal power and grace off the tee, but what they may not know is what an amazing coach of the entire game he is. Not only is he an unbelievable athlete and striker of the ball, he’s a gifted teacher with a tremendously broad repertoire of knowledge. He looks at the game and his students holistically and gets them tremendous and lasting results very quickly. With Jaacob’s guidance and tips, I probably cut about 10 to 15 strokes off my score by improving just about every part of my game: driving, pitching, chipping, putting, course management, managing the mental and emotional aspects of the game, scoring, etc. All of this information can be found on this website in concise and well organized form so that you can understand it quickly and apply it to your game immediately. Perhaps best of all, as a coach of the game, Jaacob possesses the wisdom, integrity, and clarity of a Jedi Knight. Not only does this mean that he can communicate clearly and directly essential concepts to improve your game, it also means that he is balanced, centered and mindful in his approach to the game. With the information he has put in this website, you will be opened up to a whole new relaxed and positive way of looking at the game, that will enable you to enjoy the game far more, with less stress and much more effective results. Jaacob’s not a typical teaching pro and this website is not your typical golf website. He’s not looking to make a few bucks promoting gimmicks or unrealistic results with little substance. Nor is he spouting off conventional teaching cliché’s or useless information. He genuinely cares about his students, goes far deeper than other teachers and websites, and he makes sure members of the Swingman site receive maximum value and improvement for their time and money. Not only that, but Jaacob, when I let go of the tension, the ball flight was dead straight. I am hitting the ball to areas of the range I never even new were there. This after just one week! … the 15th hole, par 4, uphill about 75 feet, over a large waste area. 315 yards to the center of the green. My playing partner laid up but I wasn’t scoring well enough for me to worry about it. Pulled driver, relaxed and swung as free as I did all day. The ball flew high, straight and carried the green to 12 feet. Unbelievable, I couldn’t hit the ball that far when I was 25 much less almost 50. I am a believer.